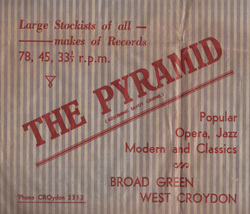 (Feb 23, 2015) The Pyramid Record Shop, Croydon was located in Savoy Parade to the left of the ABC Cinema at Broad Green. I frequented it in the mid 1960's and got to know the staff well enough for them to let me browse through their 45rpm singles in search of London American soul rarities. The counter was on the right of the shop and I recall they had a tall carousel rack displaying the E.P. 's with their picture sleeves, which I was inclined to purchase as they were cheaper than L.P.'s and often had tracks unavailable anywhere else. The pic of the ABC Cinema in 1965 would have included The Pyramid if the photographer had taken it landscape instead of portrait! Comment: Dave Harwood.